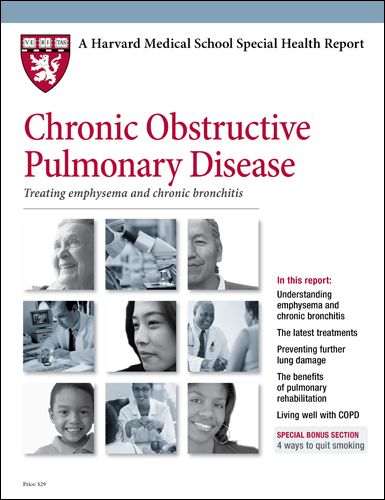 This Special Health Report, Chronic Obstructive Pulmonary Disease: Treating emphysema and chronic bronchitis, banishes misinformation about COPD and briefs you on today’s most important treatment advances. You will be equipped to work with your physician to create a strategy to reduce COPD’s effects. You’ll learn which medications offer the greatest relief with the fewest side effects. You’ll discover how you can improve breathing efficiency, avoid harmful symptom flare-ups, and reduce your exposure to often-overlooked irritants. Let the doctors and experts at Harvard Medical School help you breathe easier! Discover the advances and strategies that can help you prevent, slow, and more effectively control COPD. Chronic Obstructive Pulmonary Disease — COPD — is exhausting and exasperating. It can sap you of the strength to pursue everyday chores, as well as those activities that give you the most satisfaction and pleasure. Fortunately, as never before, advances in medication and treatment are enabling men and women to lessen the symptoms of COPD, retain greater lung function, and maintain full, active, and independent lives. This Special Health Report will give you empowering information to work with your physician to create and implement treatment strategies to manage your COPD effectively — and successfully. You’ll learn how doctors define and diagnose COPD: What symptoms distinguish chronic bronchitis and emphysema, who is most at risk, what tests are most important, and more. You’ll discover game-changing medications and rehabilitative therapies: How more than 30 bronchodilators compare for efficacy, new minimallyinvasive surgical options, and at-home programs to promote breathing efficiency. You’ll gain insights for reducing flare-ups and building stamina: How to keep your home irritant-free, the two vaccines anyone with COPD should get, helpful tools and gadget, and the do-anywhere exercise with lasting benefits. SPECIAL BONUS SECTION: 4 Way to Quit Smoking. Strategies for kicking the habit for good. Chronic bronchitis is an inflammatory condition of the airways that causes a cough that brings up sputum (a mixture of saliva and mucus). According to the formal definition of the disease, the cough must occur nearly every day for at least three months of the year for two consecutive years. In reality, doctors don’t necessarily count the months or years. If your symptoms are ongoing and follow this general pattern, it’s likely that your doctor will call it chronic bronchitis. These two conditions seem in many ways to be the same: both involve inflammation of the airways, difficulty breathing, and often wheezing. But they are really distinct illnesses with key differences. For one thing, people with chronic bronchitis have increased mucus production and may have trouble breathing just about all the time, whereas people with asthma have bouts of breathlessness and wheezing that interrupt periods when they feel fine. Another difference is that asthma symptoms are often triggered by bronchospasm—the spasmodic contraction of the airways that chokes off airflow. But bronchospasm is not typical of chronic bronchitis. The two illnesses also start and progress in different ways. Asthma affects people of all ages, and when it starts in childhood, it often improves over the years. By contrast, chronic bronchitis develops in middle age, usually in people who have smoked, and it generally gets worse over time. The causes of these two conditions are different, too. The main cause of chronic bronchitis is smoking. Doctors don’t fully understand what causes asthma, but they know that asthma attacks have a wide range of triggers, which may include allergens, exercising in cold air, air pollution, and respiratory tract infections. Unlike acute (short-term) bronchitis, which is usually a viral infection that may last as long as several weeks, chronic (long-term) bronchitis is not caused by an infection. It develops when the bronchial tubes are irritated day after day, most often by tobacco smoke. In an effort to expel the irritants, the body mounts a defense that involves inflammation and swelling of the airways, plus the constant production of mucus. The inflammation narrows the airways, and the mucus obstructs them further. Like traffic crawling through a road that’s partially blocked by construction, air moves more slowly in and out of your lungs. You may wheeze as you work hard to breathe, and you cough in an attempt to clear mucus from your airways. Some people with chronic bronchitis also have episodes that feel like asthma attacks. These may be caused by bronchospasm, a sudden contraction of the airways that makes it difficult to breathe and that may trigger a torrent of wheezing or coughing. Bronchospasm is also characteristic of asthma, which is a separate illness from COPD. 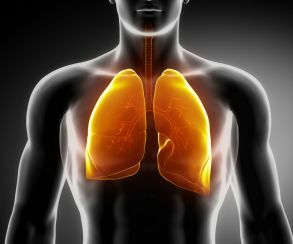 But if you have both chronic bronchitis and episodes of bronchospasm, your doctor may diagnose asthmatic bronchitis, a hybrid condition that has features of both chronic bronchitis and asthma. Doctors use many of the same medications to treat both. People with chronic bronchitis find it increasingly difficult to exercise and exert themselves in other ways. Some people experience swelling, particularly in the ankles and feet, because heart complications that sometimes occur with chronic bronchitis can cause fluid retention. You may gain weight because of this excess fluid. Difficulty breathing can decrease the oxygen level in your blood, causing your lips or the part of your fingertips under the nails to appear blue.